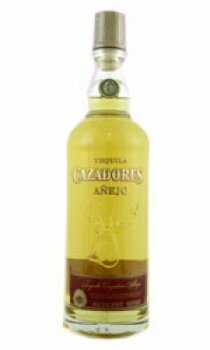 Cazadores Anejo - 100% Blue Agave, aged no less than 12 months, in new, small, American white oak barrels. The authentic, smooth flavour is best enjoyed as a sipping tequila. The flavour of Cazadores tequila reflects its excellence. It glides smoothly over the most demanding palates and delights the most refined tastes. Like no other spirituous beverage, tequila is part of the nature that created it, with strong roots that are nourished by the land and evoke spirituality and life. Neither seductive champagne, nor passionate rum, nor stylized whisky nor captivating vodka is born from a plant that is already a legend. Cazadores tequila is a clean, smooth tequila, its aroma evokes memories of agave fields and the roots in nature that they all carry within ourselves. The consistency of their product is one of its most important qualities. Whoever tastes it encounters its insuperable flavour, which is developed at each stage of the process, but it is the wood of the oak barrels in which it ages that provides the final touch. Cazadores tequila is the liquor of Mexico. It has a special aroma and well-defined taste that makes it a favorite among connoisseurs. Don Felix's efforts to preserve the high quality standards of Cazadores has been recognized and rewarded by various international organizations: The Golden Star of International Quality 1990, Madrid, Spain, and The Grand Prize of America for Quality and Service.